Who can resist a factory tour? Especially when it’s at Bailey of Bristol, manufacturers of Caravan and Motorhome leisure vehicles, and you are the owner of a much loved Bailey Pursuit Caravan. A casual verbal invitation was issued during our recent attendance at the The New Bailey Unicorn – Launch Event so, in our excitement professional interest we followed up soon after and booked an evening in a Bristol hotel. Expecting an ‘out of town’ industrial estate we were immediately surprised to see the Bailey factory nestled just south of the city centre, a stones throw from Ashton Gate, home of Bristol City Football Club, bordered by residential houses, a railway line and other industrial premises. The magnificent Clifton Suspension Bridge can also be seen from the site. Having struggled in traffic across town to reach the site the factory position features in our conversation at reception, “Blimey, how long does it take you to get to work?” we ask, “Only a few minutes, I walk … most of us do” came back the reply. This instantly appeals to our old fashioned senses and is clearly a benefit to the employer and the local community. Our host for the day, Bart, arrives with some fetching high visibility vests and off we go. New Unicorn caravans are being loaded onto transporters on route to dealers across the country. For today, we agree not to take pictures and remove our bow-tie cameras, all Bailey factory/product pictures within this article will be Bailey Media or Bailey Website pictures. We also avoid the high-tech future product development area for obvious confidentiality reasons, so have no idea what the rocket engine, laser beam and time-travel rooms were for!!! Passing the AL-KO Chassis components, axle and wheel assemblies we reach the production assembly line and immediately see naked caravans before us, we try not to blush as they have their ‘Unicorn’ graphic clothing applied before us. The assembly line is fully automated, periodically moving the caravans and motorhomes through static ‘zones’ where supervised teams work on a particular aspect of the production process, each team member able to perform all tasks within that zone. It was interesting to watch the process as the caravans are assembled ‘inside out’ and for half of the process you are looking at a furniture skeleton frame with all its vital organs and circulation system of electrical and heating on full view, before the outer skin is added. It makes total sense as the production team in each zone can work simultaneously on separate items, otherwise, imagine the chaos of ten people coming in and out a caravan door carrying pieces of furniture. We pass the procurement office responsible for the various component parts, you understand the importance of ensuring a full and continuous supply. With approximately 150 caravans and 25 motorhomes coming through this building per week you can see the problems a shortage on any item could create. For efficient productivity the assembly line will produce a pre-determined quantity of the same caravan or motorhome model before adjusting settings and operational processes to the requirements of the next model to be produced. As each ‘completed’ vehicle reaches the doors to the outside world a final checklist inspection is completed before release. A further random selection are then sent down another inspection lane, independent to the production process, for additional thorough testing. In the next building another production assembly line are building ‘Autograph’ Motorhomes. The Peugeot cabs arrive bolted together in pairs, if you remember the ‘Chuckle Brothers’ you could imagine a “to me” “to you” sketch. After they have been separated and had the AL-KO Chassis and seat-belt points installed they go to production, starting with the water tanks and under floor items. From a safe distance we watched the floor attached to the chassis and then the speedy and skillful application of the floor covering as they cut out holes for all the furniture and appliance fixing points before adding fixed flooring items such as vent covers and cable clips. 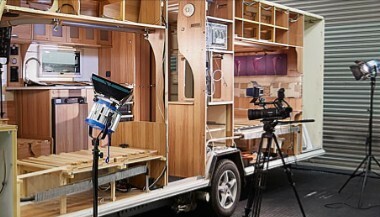 Seeing a cab and chassis driving through one door and a completed motorhome driving through the out door within the same day must be rewarding to the skilled teams involved, we remarked on the comparison to the equally rewarding creative process of one person building a camper van over months and years on their house driveway. We left the production areas behind and found ourselves looking at a caravan with tripods and cameras poking in all directions through windows and doors, lighting umbrellas and equipment bouncing light through the living areas. We discover this is where the glossy brochure magic happens. An array of fresh food sits on a side table, they must have known we were coming, but no, this is for the internal pictures, no plastic fruit to be seen anywhere. If you see a half eaten apple in a future brochure, we know nothing. All good things come to an end and Bailey need to ‘crack on’ building leisure vehicles so our trip comes to an end. We came out of curiosity, where and how was our caravan built and what is under its outer skin? We came away with a little more. Originally, this article was going to feature some history of Bailey and its manufacturing sites, but you can find all that on their website here: https://www.baileyofbristol.co.uk/. What we especially noted, both today and on our recent trip to the Bailey Leisure Store was the people, their interaction with each other and towards us indicated a motivated workforce with a pride in what they do. There is a picture on our office wall at home, it’s Tommy, the boss’ old boss, a man we both know well, he is walking through a derelict Salford factory yard (Steve worked there too … he’s a jinx) surveying an area once full of vehicles bearing his name. Yet, to him, he wasn’t a boss, he was an employer, he employed from the community, he employed people who went to the same schools together. We saw the same elements of community employment today in Bristol and it was good to see. All Bailey images published with permission from Bailey sources. Models featured in images are not the models in production at time of visit.